Bertrand at Mister A's - DowntownWhy settle for just an ocean view when you can see the entire city from one vantage point. And there's nowhere else you can see a view like this both inside and outside. Our outdoor balcony wraps around three entire sides of the building. 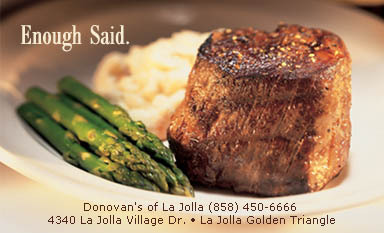 Chez Loma French Bistro - CoronadoOur award winning menu has appeared in many national and local media. Our food is made with the finest local ingredients and carefully selected imported products. Top Of The Cove - La JollaThe 100-year-old bungalow is perched high on a bluff in the heart of La Jolla and presents spectacular views of La Jolla Cove. You and your guests dine in timeless elegance at beautifully appointed tables overlooking the Pacific. Delicias Restaurant - Rancho Santa FeDelicias is a long established favorite that continues the tradition of great food, quality service and a wonderful ambiance. We offer Gourmet California Cuisine.